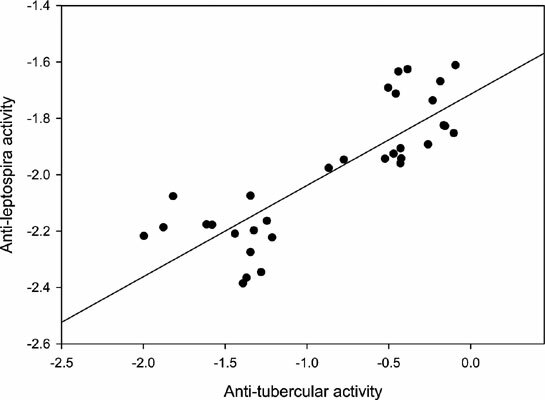 Background: The Quantitative structure activity relationship for thirty two novel substituted quinoxalines was performed for their antitubercular (Mycobacterium tuberculosis H37Rv) and antileptospiral (Leptospirainterrogans) activities. The quinoxalines were substituted with azetidinones, thiazolidinones and fluoroquinolones. Several compounds exhibited good activity against both the infections and they all possess fluoroquinolone moiety with the quinoxaline. Methods: The models developed showed good linear relationship (r2 = 0.71-0.88), with an internal predictive ability (q2> 0.61) and good external predictive ability (pred_r2>0.71). The compounds were separated into a training set on which regression was performed and a test set on which the predictive ability of the model was tested. Other statistical parameters including Ro2, Ro’2, k, k’ and Z- score were in the acceptable range. Results and Conclusion: The descriptors obtained explained the necessity of spatial orientation of atoms including branching and adjacency, presence of electronegative groups, balance between lipophilic elements and their binding strengths. Keywords: Quinoxaline, antileptospiral, antitubercular, QSAR analysis, electronegative groups, lipophilic elements. Keywords:Quinoxaline, antileptospiral, antitubercular, QSAR analysis, electronegative groups, lipophilic elements. Abstract:Background: The Quantitative structure activity relationship for thirty two novel substituted quinoxalines was performed for their antitubercular (Mycobacterium tuberculosis H37Rv) and antileptospiral (Leptospirainterrogans) activities. The quinoxalines were substituted with azetidinones, thiazolidinones and fluoroquinolones. Several compounds exhibited good activity against both the infections and they all possess fluoroquinolone moiety with the quinoxaline.